Normally, when I dye, I follow a very simple formula: Soak, add acid, add dye, add heat. However, my friend Lianali alerted me to a new possibility: no heat, no acid, just dye. 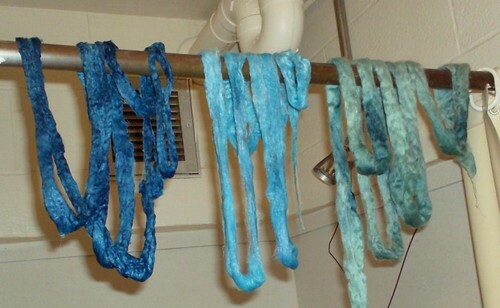 And dye that can dye a whole variety of fibers, not just animal fibers! These are fiber-reactive dyes. At Jo-Ann's, I purchased two bottles of Tulip One-Step Fashion Dyes, in blue and turquoise. Tulip uses Procion MX dye, and is marketed for Tie-Dyeing. To use these fiber reactive dyes, all you need is cold water and time. The dyes were way easy to use, and one $4 box came with everything you need - right down to the squirt bottle and rubber gloves! All you need is the water, a bowl to put your fiber in, and a plastic bag to keep it later. The powdered dye already includes the chemicals you need. You fill your squirt bottle to the top with water, shake it up so the powder gets mixed in (the powder is already in the bottle - no messy packets), and squirt around to your heart's delight. Then you have to leave it damp overnight (6-8 hours), and rinse it out and let it dry in the morning. 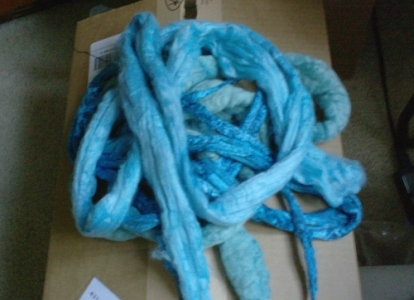 I dyed up 2 ounces of Blue-faced Leicester wool, 1 ounce of nylon, and 1.5 ounces of bamboo. I intend to card them together to spin up a pair of lovely socks, so it doesn't matter that the colors came out so different because I'll be blending them anyway. The bamboo came out as a really brilliant royal blue, the nylon a lighter sky blue, and the BFL a more greenish pale teal. There are small, subtle variations in the saturation of the colors, but these rovings aren't variegated by any means. I put too much water in the pot, I think, so the dyes all mixed. I had squirted the dye in haphazard stripes, but it all mixed as it was sitting in the water. Speaking of dyeing, I have received some skeins of merino laceweight yarn which I'll be dyeing this weekend, and listing next week. I'm very excited about these, because I love to knit lace, so I'll update you on that later. Holy crap, that's amazing! I'll have to take pictures of the silk that I did. I think I'll be re-dyeing the lighter portion. I cannot WAIT to start spinning with it, though! How cool are those. Really bold and vibrant colorways! knitwit said it! Holy crap. It is so suprising that different fibers look different. Thanks for sharing such a stark and pointed example of this!